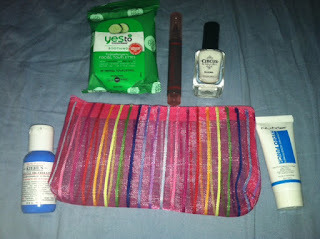 I just LOVE the MyGlam July Bag! SO incredible! It had just the most perfect products for summer! First, I am loving the bag everything came in this month. It is a cute see through striped bag! Circus by Andrea's Choice Nail Polish- Full sized--It does not go on sale until Fall 2012. I am in LOVE with the color, which is like a white. I have no idea what to value it. I am giving it a value of $5, but I bet it will retail for MUCH more! Josie Maran Lip and Cheek Stain. I wish I had gotten a better color. It is really dark for my light, light skin! Full sized?? (Please someone correct me if I am wrong!). Amazon value= $19.00. Total value: $35.12 AND you get a cute travel bag. LOVE it! I have that problem with things being too dark for me ALL of the time! I really like the bag this month! Love the organza bag!! Too cute! I think I need to re-sign up for MyGlam after see this bag. They are definitely improving! I only started subscribing last month, but it seems like they stepped up their game! Wow it seems like you got a lot of cute stuff in it! That bag is too cute!! Nice box! Got myglam bag today I didn't get the Kiehls (wish I had) but that is cool. I got Juice Beauty green apple spf 15 moisturizer and instead of the lip stain I got Buxon lip gloss whis I guess is ok. I got some lip stain last month in my Birchbox. Everything else was the same though. I do thing it was a much better bag than last month. I am happy!